This post contains spoilers for “Kina Hora,” the first episode of “Transparent’s” second season. Critics have been going wild for “Creed’s” one-shot boxing scene, but I’m more thrilled by the four-minute take that opens “Kina Hora,” the first episode of “Transparent’s” second season. (It’s now streaming via Amazon Prime; the rest will be released on December 11.) The setup is deceptively simple: A static camera records the Pfeffermans as they gather for a family photo on the day Sarah (Amy Landecker) and Tammy Cashman (Melora Hardin) are to be married. But the attempt to manufacture a moment of perfect togetherness keeps getting disrupted, by last-minute decisions about who should be included — Tammy’s ex-stepdaughter, Bianca? Sure! Josh’s girlfriend, Rabbi Raquel? Why not? — and by the Pfeffermans’ collective inability to set aside their personal grievances, even for the length of a shutter click. As Eric Thurm writes at the A.V. Club, “The important thing here isn’t any one person, but they way they act together as a self-hating, self-loving organism. The point is in the whole frame, rather than in any individual who occupies it.” (The shot even layers in hints of a longstanding animosity between the wedding planner and the event photographer, as if to remind us that the Pfeffermans’ story is not the only one there is.) As Rabbi Raquel will later say of the wedding itself, the photograph is “an expensive play,” a symbol of familial concord rather than the thing itself. That shot is worth returning to throughout the season; the more you watch, the clearer it becomes that “Transparent’s” creator, Jill Soloway, has laid out an entire season’s worth of conflicts in a single four-minute stretch. It’s characteristic of Soloway’s understated but enormously smart and sophisticated directorial style, which is sometimes overshadowed by “Transparent’s” groundbreaking subject matter. It’s certainly not as flamboyant as the max-headroom compositions of “Mr. Robot,” which inexplicably beat “Transparent” for the Gothams’ “Breakthough Series — Long Form” award. (As Jonathan Lisecki pointed out on Twitter, “Mr. Robot” was the only one of the five nominated series created by a man.) Soloway likes to give her characters room within the frame, often using sound rather than close-ups or camera movement to cue us where to look. Although the opening shot doesn’t favor any one character over another, the soundtrack does: When Tammy is shouting for people to get into the picture, her voice never rises above the din, but when trans matriarch Maura (Jeffrey Tambor) frets about stepping out of her shoe, it rings though loud and clear. As it turns out, all this verbal chaos is misdirection of a sort, diverting our attention from the shot’s silently anguished center: Sarah, whose mounting unease with her imminent marriage will detonate before the episode’s end. At a wedding, the bride is supposed to be the center of attention, but Sarah’s siblings and her parents — even her bride-to-be — are so wrapped up in their own concerns they don’t notice she’s fading until it’s too late. As Sarah prepares to walk down the aisle, Soloway shifts the depth of field so that she’s isolated in the foreground, and moves from naturalistic sound to an echoey, underwater effect, eventually severing the connection between image and sound altogether. Later, after she’s pulled out of the bathroom to belatedly join the celebratory hora, the camera briefly takes on her subjective point of view, spinning in a dizzying circle and recalling Maura’s words from the first season: “Baby, you need to get in the whirlpool or you need to get out of it.” Sarah is in it, and she wants out. Soloway wrote and directed a third of the second season,which arguably makes “Transparent” as close to a classically auteurist work as American television has ever produced. “Transparent” isn’t a mood-driven genre piece, like “Breaking Bad” or “True Detective,” so the direction rarely calls attention to itself, but Soloway and cinematographer Jim Frohna consistently find surprising ways of shooting a scene, pushing characters to the edge of the frame in ways that subtly suggest their unbalanced relationship to the world around them. In a way, it’s not so different from “Mr. Robot’s” off-kilter framing, but where “Mr. Robot’s” images are hard-edged and deterministic, “Transparent’s” are fluid and full of light. As with the relationships between the Pfeffermans, there are no firm boundaries, just a constantly shifting back-and-forth that they’re always struggling and failing to get a handle on. 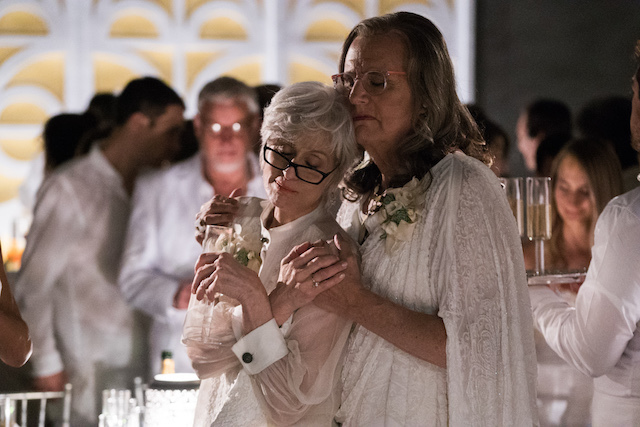 “Transparent” is a show about people coming to terms with the fact that the lines we’ve drawn to make sense of life — between male and female, parent and child, straight and gay, self and other, the present and the past — end up blinding us to who we are, which makes it impossible to see others with any kind of clarity. Where “Kina Hora” stars with a still frame, it ends with a lateral tracking shot, moving from one hotel room to the next as we watch each of the Pfeffermans dealing with their own personal crises. At night, from a distance, their rooms look like lighted boxes, each sealed off from the others, recalling a similar setup in Jacques Tati’s “Play Time.” But the movement of the camera links them together, reminding us that, as much as we fantasize, or agonize, about being alone, we are always connected to each other.